Furnace Versus Heating Boiler: Which System Saves You the Most? Heating boilers are particularly common and popular in colder climates that are farther from the equator, such as what we experience here in Canada. Then again, forced air furnace systems are popular in the same types of climates for the same reasons. You may have more familiarity with one system over the other depending on where you have lived and in what climate you grew up. In this post, we take a look at the similarities and differences between a heating boiler and a traditional furnace system so you can learn more about each to help you decide which you should have. If you are used to having warm air blowing down onto your head or up at your feet, chances are good the appliance doing all that blowing is a forced air furnace. A forced air furnace uses a heat exchanger to blow (“force”) air into a duct network to keep you warm. This heating system heats the air, which in turn raises the temperature in the room and heats you. A furnace can run on electricity, natural gas, propane gas, oil or wood. A heating boiler uses hot water or steam to send heat energy through a distribution system. That heat then radiates out into the room (hence the term “radiant heater”) to warm you up. 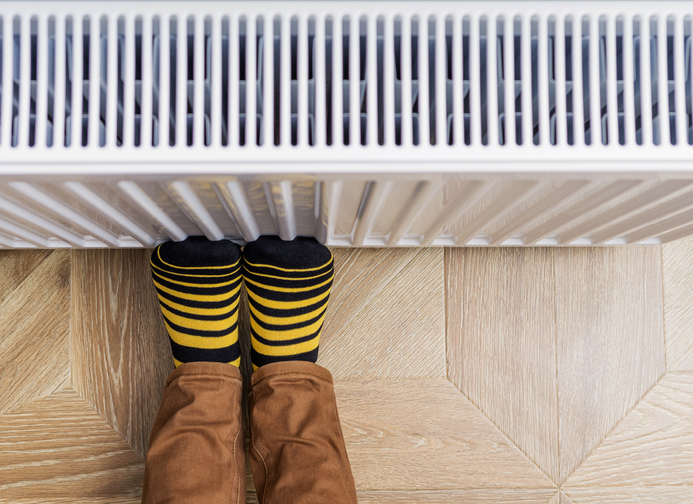 Heating boilers can work with radiant flooring, wall pipes, hydronic air handlers (a type of duct system) or old-fashioned radiators to do their work. A heating boiler can run on electricity, natural gas, propane, oil, coal or wood. In some cases, heating boilers can also accommodate your hot water needs. Now let’s take a closer look at each system and see how they stack up in terms of initial cost, ease of installation, maintenance and more! There is no doubt that the forced air furnace wins hands down in the initial cost department—that is, as long as you have an existing central duct system already in place and you have ready access to your chosen fuel type. A recent survey showed that the cost for a new furnace plus installation ranges from $1,950 to $5,780. However, heating boilers can also deliver your hot water, which can make them look like the real bargain if you need to replace the water heater too. The national average for purchasing a new heating boiler plus installation ranges from $3,418 to $7,672. A new forced air furnace will generally deliver anywhere from 80 to 97.5 percent energy efficiency, not counting losses due to duct transmission, which can add up to 35 percent or greater. New heating boilers can deliver between 87 and 90+ percent energy efficiency depending on the fuel source and extra features such as an electric pilot light and sealed combustion to minimize wasted energy. In most cases, you will realize slightly higher energy efficiency by choosing a heating boiler since you won't face energy losses as air passes through the air duct network. The amount of space your new system requires will depend on what type of system you select. If you opt for an outside-only unit, the only inside space you need will be whatever is required to install a distribution system (ducts, pipes, etc.). Inside-outside furnace systems typically install the interior component in the basement, attic or crawl space. A multi-purpose heating boiler equipped with a tank for hot water may be wall mount-equipped to conserve floor space. If either system requires interior floor space inside your main living area, typically the minimum floor space required is equivalent to what a free-standing floor washer and dryer system would need. Both a furnace and a heating boiler will need at least once-annual maintenance and safety inspections for both energy efficiency and safety reasons. Maintenance for the typical forced air furnace is slightly more costly and labour-intensive because there are simply more components to maintain. You will need to change the furnace filters regularly (typically every month during winter). Other needs include cleaning your air registers and exhaust vents, and periodically having your indoor air duct system cleaned and maintained. Heating boilers have fewer components to inspect and maintain. Boilers don’t use filters and most don’t have any ductwork at all. However, if your boiler has a tank, you will need to drain and clean it once per year along with its annual safety inspection. New models of forced air furnaces and heating boilers have the same average life expectancy of 15 to 30 years. What can impact the useful life of your new system is how well you maintain it, plus your use patterns. A well-maintained furnace or boiler can last into the triple decades. A forced air furnace system is still the most popular heating system because the presence of a duct system makes it easy to deliver both warm and cool air throughout your space. However, it is relatively simple to install air conditioning via a new energy-efficient ductless mini-split, which uses a zone system to help you control your costs for cooling each zone in your home. And if you have an existing air duct system but you want to convert over to a heating boiler system for heat, the air ducts can still come in quite handy for delivering cool air. Do you need expert guidance to choose between a new forced air furnace system or a new heating boiler system? We can help!